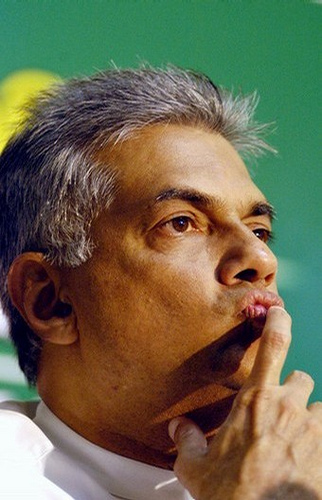 “The CEO of HSBC in Sri Lanka discounted the UNP threat as ‘silly… political tub-thumping.’ He said there was no way a future UNP government would voluntarily default, and was confident that international markets would be unconcerned by the UNP position. Other international bank and credit rating agency reps gave Econoff the same assessment.” the US Embassy Colombo informed Washington. The Colombo Telegraph found the related leaked cable from the WikiLeaks database. The unclassified cable discusesSri Lanka’s debut sovereign bond issue. The cable was written by the Ambassador Robert O. Blake on September 05, 2007. The ambassador wrote; “The Government of Sri Lanka plans to issue the country’s first international sovereign bond, in hopes of raising $500 million to fund infrastructure projects. However, the main opposition United National Party has announced that a future UNP government would not honor the bonds, which it claims the country cannot afford. UNP reps told us that their effort to sink the bond issue is primarily political though — an effort to keep the government from being able to buy the continued loyalty of former UNP MPs who joined the government as ministers last January. While markets will likely correctly view the UNP threat as a political move that would never materialize, the timing of the pending bond issue appears to be as bad or worse as sixteen months ago, when the government shelved an earlier plan for a $1 billion sovereign bond issue. Sri Lanka has had little good news to reassure currently skittish international debt markets. Nevertheless, market watchers say that the relatively small bond issue will probably appeal to a sufficient number of international investors who remain interested in diversifying their holdings of high-yielding emerging market debt. “The opposition United National Party has challenged the government’s plan to issue the bonds. UNP leader Ranil Wickremesinghe wrote to JP Morgan, Barclays, and HSBC August 24, stating that ‘the bond issue is in violation of the law’ and that the ‘a future Government formed by the United National Party will not be able to honour the repayment obligations under this bond issue.’ In the letters, Wickremesinghe charges that the government has not informed Parliament of its plans to issue the bonds; that interest payments on the bonds ‘will hamper the sustainability of Sri Lanka’s long-term programme for servicing its existing public debt repayments’; and that the bonds may contribute to corruption, since planned ‘major infrastructure projects… have all been funded by bilateral and multilateral’ lenders. Wickremesinghe sent similar letters to U.S. Securities and Exchange Commission Chairman Christopher Cox and to Cox’s UK equivalent, urging them to ‘consult with the banks concerned and bring to a halt the issuance of this sovereign bond. '” Ambassador Blake further wrote. civil war made the timing inopportune. Hong Kong to publicize the planned bond issue. privatization of the national airline in the 1990s. that international markets would be unconcerned by the UNP position. Barclay’s or HSBC to lead the bond issue. ex-UNP ministers by permitting them to pursue pork-barrel projects. private sector (like an expanded oil refinery at Sapagaskunda). holdings of high-yielding emerging market debt. 20A: Why The Indecent Haste ? Because he is cool now, after awarding his mate’s son in Law 6500 Million worth of Bonds at 13 % interest fixed for 30 years. Unlesss the then Opposition leader had a vision that he may have the chance to hire his mates one day, and re negotiate the the Sovereign Bond also at 13 % instead of the lousy 8.25 % which Cabby gave the West. The UNP had every right to oppose the sale and I am not surprised by ‘Ranil’s’ statement. HSBC, Barclays have messed things up for themselves, big-time. They should have known better. They were buying from a bunch of thieves who robbed the countries ‘Tsunami’ funds. Probably this is the only far sight wisdom the current PM will get it right. Interest based debt creates eventual death to all those who indulge in it. Governments consider the alternate method of financing productive growth driven by Islamic Shariah compliant investments. Honour is not a word one would associate with RW. So I suppose you would associate it with MR ???? So now that you have vomited up every negative thing you can dig up to Slander the PM would you mind telling us what is in the report of the investigation into the CB bond issue fiasco. Don’t restrict your self to Raja Mahendran tell us about the goings on before he became governor. How were bond issues handled? How much money was raised? To whom were they sold? How come nothing was ever investigated before? Is this the gratitude you give to a man who has tried to govern fairly. This nation is a truly cursed place for one simple reason. No gratitude non what so ever. Always dwell on the negatives, refuse to admit anything positive. I whole heartedly support your comment Weera. The nation is a bunch of uneducated, illiterate, ungrateful souls. In fact nothing should be done for the betterment of the Country or the people. People live on kassippu /ethanol and have partially or impartially blocked their brains. You can and never will get a good word from anyone about anyone in public office, who works for a pittance and is therefore compelled to rob as they too have to keep the home fires alight. The Country has a phobia against anyone trying to get a job done. Elected or not, we were all aware that if MS became President, RW would be been the PM. SO what’s the shok about it? Elected or not, it’s something the entire Country was aware of long before the election . He is the only decent , clean politician that we have. God save & protect him. The post of President was grandiose during the term of the Raja s.
People Like K Sumane needs to start with primary school math to understand the differences between now and then. First value, 500USD million is 65 Billion SLR, which is pretty much 1/13th of what offered this time. Even a little kid would understand the HUGE diff in the bond value and HUGE diff in the payments thats attached to it, do you Sumane ? Then, choice, Sumane can you dig into Cabarayas head and let us know why JP not, lets say, Goldman or Morgan Stanley or any other investment bank for that matter, was picked ? Was there any proper procedure in selecting the underwriter ? Next, Rate, Sumane just a little lesson for you on economics, when countries, esp developing countries issue bonds, they tend to give higher rates for the ones that are issues in local currencies, because they are not subject to huge FX market fluctuations so they carry low risks. But when they do in other currencies, like USD in this case rates tend to be in the lower side, esp. credit ratings of that country is good. Now, please let us know why Cabaraya thought 8% is a good value ? Are you aware that some other banks that were following this deal, thought this is a rip off, and SL could have gotten a better deal ? Funny thing is Sumane, Sri Lanka could have easily obtained this loan from IMF or ADB, or even from Japanese Government ODA, for a much lower rate. So why Cabaraya had to rush to JP Morgan to create this whole fiasco ?